Pediculosis is caused due to infestation of blood feeding Phthiraptera, and an ectoparasitic insect Louse. Lice saliva enters human circulatory system, while sucking human blood and this causes puritus. Pediculosis spreads through close physical contact, cloths and linens, combs, hats, and others. Globally, increase in prevalence of pediculosis, rise in the awareness regarding pediculosis and growing adoption of human lice in forensic studies are the prime growth drivers of pediculosis treatment market. In addition, increase in adoption of pediculosis treatment in emerging economies such as China, India and others will create new opportunities for pediculosis treatment market. 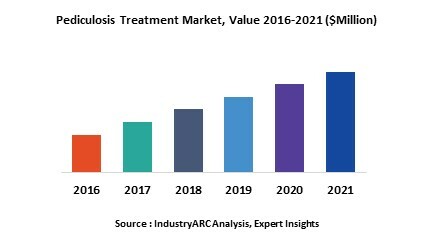 However, higher cost of the research and development, and lack of diagnostic tools and condition specific treatment are the key restraints for pediculosis treatment market. This report identifies the global pediculosis treatment market size in for the year 2014-2016, and forecast of the same for year 2021. It also highlights the potential growth opportunities in the coming years, while also reviewing the market drivers, restraints, growth indicators, challenges, market dynamics, competitive landscape and other key aspects with respect to pediculosis treatment market. Geographically, North America dominated the pediculosis treatment market due to modernize healthcare infrastructure, higher healthcare spending, reimbursement coverage and government support. Asia Pacific is projected to have the fastest growth, owing to rapidly increasing aging population, rise in awareness about pediculosis and related treatments, modernization of healthcare infrastructure and growing medical tourism industry in developing nations such as China and India in this region. Among all the louse type, pediculosis pubis has the highest market share in pediculosis treatment market.